PARAMARIBO, Suriname – Former military ruler Desi Bouterse officially began a second consecutive five-year term in office after being sworn in yesterday, promising to diversify the country’s economy and make the country less dependent on bauxite, gold and oil exports. During his inauguration speech, he said the people of Suriname now have “the unprecedented opportunity to let our economy no longer be based on sharing profits from foreign-based interests”. “We no longer want to depend primarily on market decisions such as the gold price controlling the price of alumina and the price of oil,” 69-year-old Bouterse told the gathering that included Guyana’s President David Granger and leaders and top officials of other South American nations. “The time is right to develop new sectors which will guarantee a sustainable development for us,” he added, identifying tourism, renewable energy and agriculture among those areas. 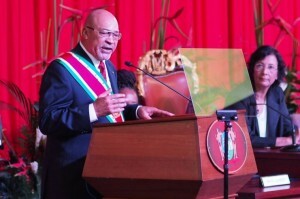 Bouterse was reelected president, unopposed, by the National Assembly last month after his National Democratic Party’s slim election victory in May. Yesterday he also announced a new 16-member Cabinet. Bouterse is leading South America’s smallest sovereign nation at a time of significant economic challenge, as the country continues to be affected by falling gold and oil prices. A task force which he recently set up has recommended that he raise taxes, increase utility prices and cut government spending. Although this is only his second term as Suriname’s democratically elected president, having been elected in 2010, Bouterse first led the country in 1980 after staging a military takeover. He stepped down in 1987, but returned for a year in 1990 after a second coup. He has been dogged by controversy – accused of murdering political opponents in 1982 during his military leadership and convicted in absentia in the Netherlands on drug trafficking charges.